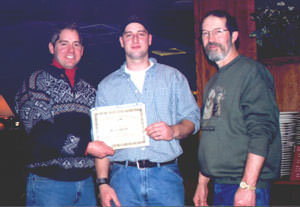 When you are looking for the best education in taxidermy, look to International Taxidermy Champion Dan Rinehart. With over 20 years of teaching experience, I understand what you need to have a successful taxidermy learning experience. 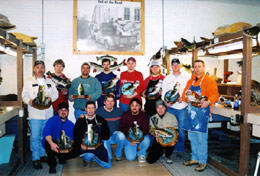 Exposure to the most effective techniques and proven teaching procedures insure that you learn and retain professional quality taxidermy techniques. In 1981, at the age of 13, I performed my first taxidermy seminar. Twenty-one years later, I'm still teaching with more enjoyment and success. The curriculum that I have developed for you will make your taxidermy learning experience effective AND enjoyable. Take some time and look through my web site. Below you will find general information about our different course offerings. I believe you will like what you see and we will be working together on your taxidermy education - SOON!! We refer to this these courses as the FULL-TIME program because classes run from 8am-5pm, Monday thru Saturday. These classes offer the most comprehensive education available in taxidermy today. Classes have been perfected and refined over the past 25 years to provide you with the highest quality taxidermy education. The classes are taught using a very effective "Lecture/Lab" process. First, you stand alongside the Head Instructor as they demonstrate, step-by-step, the quality taxidermy procedures that you will master. Second, following the detailed lecture, you return to your fully-outfitted work-station and perform these techniques under the supervision of the instructor. This is a "tried and tested" learning procedure and IT WORKS! Learn More About Our The Taxidermy Courses Offered.